I've wanted red shoes for a long time. (I had a baby last year and didn't want to invest if my size might change.) I ordered Burnley & Trowbridge's red shoes many months ago and waited for them to arrive as my size was out of stock. I then waited another month as my 80 year old shoe repair man put the protective bottoms on the sole. I got them back last week and am very excited, but I now need buckles. ...a very cool Victorian pair by Vgvintage that, I think, would be appropriate for the 18th century if they had a fork and fiddle (pictured on the right). To their credit, the toe and heel have a fairly nice shape for the late 18th century. Plus they're vintage. 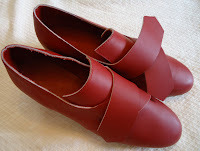 Who doesn't love vintage shoes? If they were my size I would swoop them up and make a silk gown with green trim. The Tudor Rose shoe buckle mimics the rose in the design of this 1780s shoe buckle in the V&A's collections (accession number M.33-1909). The Celtic Knot buckle kind of coordinates with the buckle in the bottom right corner of this 1737 set from the V&A (accession number M.8-1937) as well as this 1780s collection in the bottom right corner (accession number M.40-1909) also from the V&A. Fugawee sells several buckles with rhinestones as part of the design. (Though it's not to my taste.) I found this pair that's actually American in the PMA's collections (accession number 1929-168-7,a b) that sort of validate the Fugawee version. 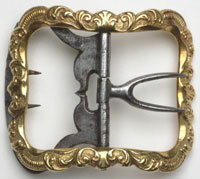 Of course the buckle I fell in love with is this one from the PMA's collections (accession number 2005-68-72). Hmm, how can I obtain a repro? I saw that you're reading my blog and I just wanted to stop by and say hello. So, hello. I also like to share some fun information. 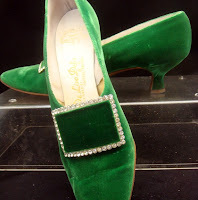 Thanks for sharing information about the velvet shoes. It's exciting to know there's an example with a great history. Aren't these shoes great! My birthday is next week, and a pair has been on order for me in the red as well, and I am awaiting their arrival! 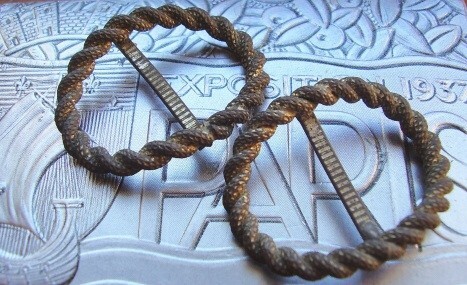 I have simple, oval dark bronze buckles that I have had on another pair of 18thc. walking shoes for several years, and plan to use on my new red ones! Have fun wearing your new shoes! Personally I like a little bling on my buckles but that PMA buckle is certainly swoon-worthy. I'm enjoying reading your blog. Lol... I read your post about buying your red shoes for your birthday- I did the EXACT same thing several months ago from Angela at B&T. I too always wanted red shoes. They are uber cute. Enjoy your new birthday shoes- they look really nice with the blue & white print gown.